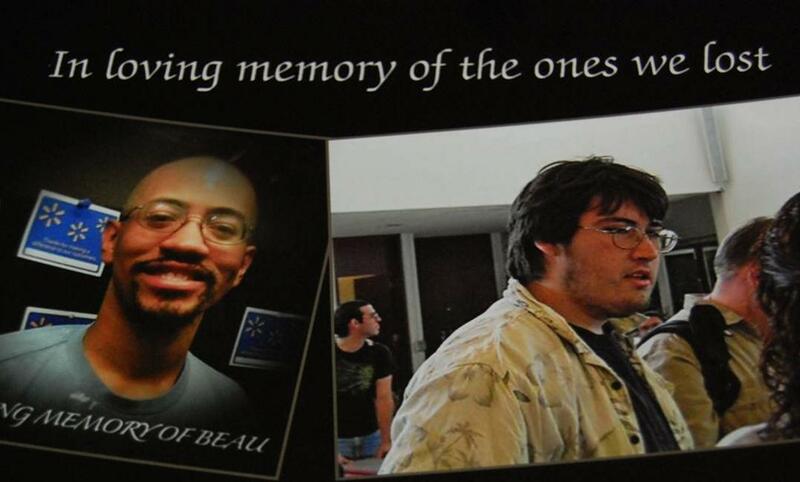 In the days following the fatal crash, Walmart associates created memorial photos of Beau (left) and Jeffrey (right) in Walmart Photo Department. LANCASTER – Nearly two years after the car crash that killed two local Walmart employees on their way home from work, the man accused of driving drunk and causing the collision is on trial. Tommie Lee Cole knew that it was dangerous to drink and drive, yet he consciously got behind the wheel after having six beers and caused the collision that killed Jeffrey Gilstrap and Beau Fluker, Deputy District Attorney Edward Wiley told jurors during his opening statements Thursday morning. Around 2:26 a.m., on Feb. 26, 2012, 26-year-old Fluker and 23-year-old Gilstrap were carpooling home from a late-night work shift at the West Lancaster Walmart, when their vehicle collided with Cole’s vehicle at the intersection of 20th Street West and Avenue J in Lancaster. In an Antelope Valley courtroom Thursday morning, the prosecutor projected graphic photos from the crash scene onto a courtroom screen. The photos showed Cole’s vehicle with massive front-end damage and the victims’ mangled vehicle on its roof on a wet street. The evidence will show that the collision caused the victims’ vehicle to flip into the air and come down on a fire hydrant with such force that the hydrant “snapped off at its base,” Wiley told the jury. The evidence would also reveal that a blood alcohol test conducted 56 minutes after the crash put Cole’s BAC at .21, nearly three times the legal limit, Wiley said. Wiley said he would be calling more than a dozen witnesses to the stand during the trial. The evidence would include Cole’s driving record, that showed a DUI arrest in 2009, and Cole’s video-taped admission that he “most definitely” knew that it was dangerous to drink and drive. “That is why this is an implied malice [murder] case,” Wiley told the jury. But defense attorney, Robert Nadler, signaled that he would call into question which car had the green light at the time of the crash. He said a civilian witness would testify that the victims’ vehicle was traveling between 60-70 miles per hour on the 45 mph road. Nadler said the case was about two cars traveling at similar speeds that both entered the intersection at the same time, and there was a difference of opinion as to who had the green light. Cole’s video-taped interview with investigators, in the hours after the crash, showed Cole was forthcoming and cooperative with investigators, Nadler said. Cole, now 27, is charged with two counts of second degree murder, two counts of gross vehicular manslaughter while intoxicated, two counts of driving under the influence and causing injury, and two counts of driving with a blood alcohol level of 0.08% or greater and causing injury, court records show. He has been in custody since his arrest on Feb. 26, 2012. The trial continues tomorrow at Antelope Valley courthouse. 9 comments for "DUI double murder trial begins"
As Tommie’s cousin I would like to say this is a horrific accident and horrible tradegy to all families involved including ours! I can tell you that Tommie didn’t set out that night to kill anyone on purpose. He made a bad decision which caused two young men to be taking far to soon. I can say from the bottom of my heart that there isn’t a day that goes by that Tommie doesn’t replay that night in his head. He is very remorseful for his actions! Our family also lost a loved one at the age of 30 to a drunk driver, so I do know the pain of the families involved. All I can say is life is too short to hold a grudge against Tommie, so I hope you can find it in your hearts to forgive but never forget. I dont live to far from the accident scene and I have seen Jeffrey before he was taken from this life. I never knew him nor do I recall ever saying hello. The day I saw their pics posted I then recalled having seeing him in passing. Its such a shame that Beau and Jeffrey died so senselessly to someone so selfish and careless. Nothing can bring them back and the person who caused all of this is guilty NO matter what. Whether he was drinking before the beers or after, fact remains that he drank and drove. Let us pray that justice prevails and that the families involved can find comfort. The reason the defense is doing all of this is to get rid of the MURDER charge. Normally, dui deaths only get vehicular manslaughter. ( Max is 7 yrs). If the DA can show malice or priors, it changes it to 2nd degree Murder. 25 to life. Just for your info. If a person is drunk, I think the accident is their fault automatically, so I’m unsure of what the defense lawyer is hoping to prove. The guy who is 3 times the legal limit is at fault, 100%. I am guessing that the defense will try to put into question whether or not Tommy Cole could have consumed enough alcohol to bring his BAC up to 0.21% within an hour after the crash. As well, bringing into question whether or not the victim was driving recklessly will definitely be brought up, however most modern car computers maintain a log of acceleration, seatbelt status, and speed that can be retrieved after a crash. At most, I think the defense will attempt to have some of the charges dismissed, but it is not likely. I knew Beau for 10 years. A constant source of ribbing was about joking how slow and safe he drove. It was so true as well. A drive I would make in 10 minutes while speeding and leaving after Beau it would take him 20 minutes. This murdering [removed] is trying to call into question the driving habits of the safest driver I had ever known. Even though he had blew a .21 an hour after he killed two people who deserved to live way more than he did. The wrong person died that night. I hope he never gets out of prison. Yes Yes Yes Beau was a very cautious driver. I’ve known his family for a long time and I can’t believe he was exceeding the speed limit…it was not his style. It’s obvious as to who is/was at fault. The defense is just pulling at straws.